This site has been here a few years now but the information is still every bit as valid. You don't need to be an expert to grow clematis from seed; even ordinary amateurs such as you or I can manage it! It does require some patience, but not that much. Get your seeds sown today! Every large-flowered hybrid seed germinated will produce new, unique blooms; you will be the first person to observe these brand-new and usually very beautiful flower forms! What the chances are of producing something different, or interesting, in terms of the flowers; who knows? But you might or might not be lucky. Nevertheless, there is always some magic in experiencing the opening of the first flowers of a new Clematis plant you have grown or hybridised yourself - every time! After germination, development can be rapid. Some seedlings can flower in the first year, although first-year flowers (and sometimes second) are not always representative of the final form. This site is just a summary of some new large-flowered hybrids, as they come to flower, together with some species plants, and other various clematis plants, all grown from seed from several sources (my plants, British Clematis Society Seed Exchange; International Clematis Society Seed Exchange; ad-hoc private sources; correspondence with other amateurs; contacts home & abroad, etc). The purpose of the site is to serve as a reference point for any other amateurs who happen to be raising their first seedlings. 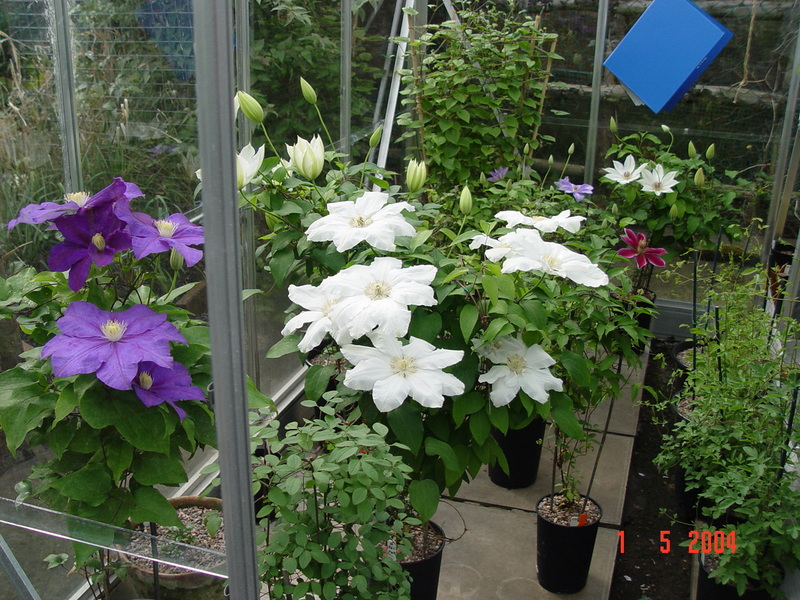 2001 saw the addition of a number of new plants; large-flowered hybrids, species (especially seed acquired as C. texensis) and other hybrid clematis plants, from various sources. 2002 also saw the addition of a further batch of various large-flowered hybrids, and species, plants. 2003 added about 60 new large-flowered hybrids and 30 or 40 species and other hybrid plants. 2004 will amount to approximately 45 new large flowered hybrids (not all on site) plus several species plants. For 2005 the emphasis will be on species and hybrids. 2006 & 2007, 2008 & 2009 archives summarise activities since. See the Updates page for site changes. After this 'introduction' page an "Overview" page summarises the main points; this is followed by individual pages covering specific aspects: including acquisition of seed; germination and hybridisation details and data; details of the manner of growth of clematis, pictures of the various stages of growth from seedling to flowering plant; additional more-detailed notes on dealing with clematis seedlings in their first year; some notes on growing larger numbers of plants; pictures of the large-flowered hybrid plants raised in Year 2000 and previous years, followed by new plants flowering in Year 2001, Year 2002, Year 2003 and Year 2004; then Species plants, and Other clematis plants; Several Archives- Year 2002 Year 2003 Year 2004 Year 2005 Year 2006 Year 2007 Year 2008 and 2009 have been added, to accommodate more-general clematis-related items of interest; plus a links page to get you quickly to the other main clematis web-sites. If you look at the 'site map' you'll get the quickest picture of what is where. You can move around the site from the menu there, or from each main page - there are links at the top of each page. Finally, there is a Guestbook, in which suggestions or comments may be entered. Most images are "thumbnails" - click on the small image and it will enlarge. Suggestions welcome, and if you spot any information you consider incorrect, or requiring clarification, please let me know. If you like this web site you might enjoy taking a look at the British Clematis Society web site, or the International Clematis Society web site; there are links to both on the Links page (click on the link and you're there). Both organisations are keen to help with any queries or problems. 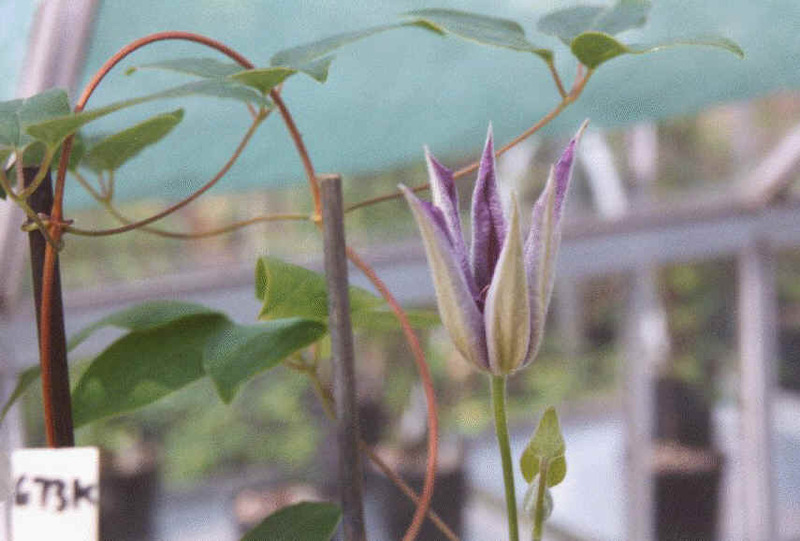 If you want to read some really interesting material on clematis a suggestion I can make is to get hold of the above Societies' past Journals. The articles from the older Journals are invaluable for amateurs, because often they are the personal experiences and records of some of the world's best and most renowned breeders, over many years. A good example being the articles by the late Uno Kivistik, as per the above-mentioned site. Joining a Clematis Society is well worth while. If you join the Clematis Societies you will receive the Journals each year, as they are published. (At present the I.Cl.S. is making available back-copies of it's annual Journal, which are an absolute "must" to purchase. In the post today (18/05/00) (some time ago now!) has arrived the I.Cl.S. annual Journal "Clematis International". Yes, I put down everything to read it, cover-to-cover, first thing. Again an absolutely superb publication, including articles on growing clematis from seed; also many other items of news and interest from around the clematis world). 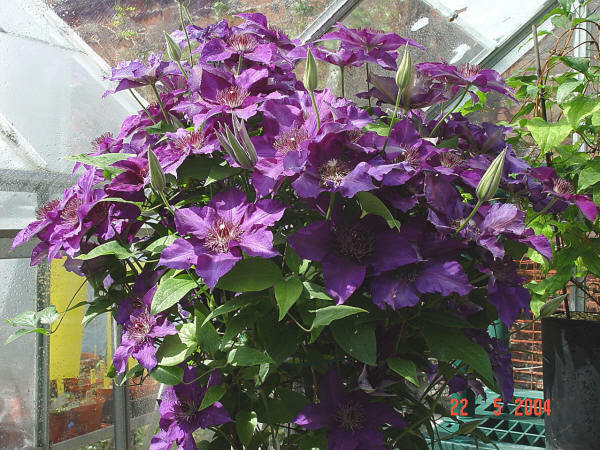 In addition, there are interesting members' study days and meetings, where you can often purchase plants, and meet other people who are interested in clematis. The costs are modest, and you get access to the "seed exchange", which is a straightforward route to acquiring and growing a wider range of species and hybrids. You can join "on-line" at the web sites, or by post, or at many garden shows, in Summer. As an example of an interesting website, I'd especially recommend visiting the (updated) KIVISTIK site, it's more than worth a look. The photographs of Roogoja are interesting, to say the least. There is a direct link here - click on the link and you're there. Click your "back" button to come back here. You can cross-pollinate clematis yourself. Its easy to learn how, and you become more confident after a couple of tries. You don't need technical equipment or a degree in Botany, just some care. Recently the B.C.S. published a good point-by-point "method", which is ideal for anyone considering this undertaking. Click to go to site menu at Top of page. This site was created by B. Collingwood for the purpose of providing clematis-related information, using my own software and support hardware.